The Range of cotton yarn that we produce is as follows. Having well equipped Uster Machines in our Testing Lab we take utmost care at all the processing levels to ensure that only quality yarn is produced to meet international export standards. We also follow manual contamination collection for controlling contaminants. The significant feature of our cotton yarn is its high tensile strength and its superior quality. These Cotton Yarns are highly demanded in most of the quality sensuous markets. 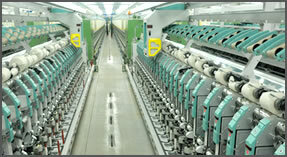 We supply all kind of optimum quality Textile Yarns on very reasonable quotes. Our stringent commitment to Global standards of Quality has created a niche of our own, in the highly competitive world markets.